We hold a selection of prismatic, etched and opaline glass lampshades along with aged brass, brass and chrome metal clam shell and coolie shades. Traditional and contemporary table lamp, wall light, uplighter and ceiling pendant light shades. All our lipped shades have Galleries available to fit between the shade & the lampholder. 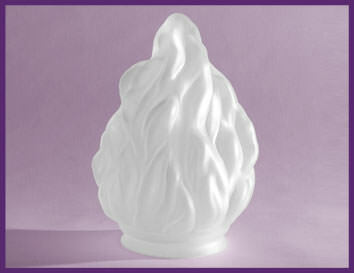 We also stock glass shades with ES size & BC size holes to go directly onto a lampholder. 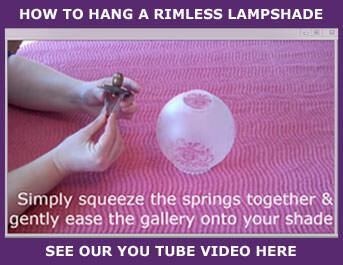 Our videos below show you how to use a gallery if you need one & which one to choose. 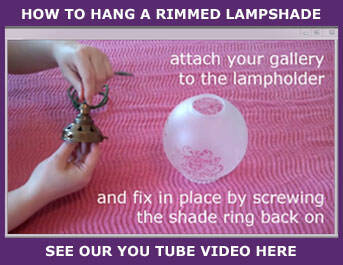 For more information on Light Shade Galleries please see our Galleries Information pageFor clear step by step advice see our Blog: How to hang a rimmed light shade. For details of how to hang our shades please see our Videos below.